Andrea Dovizioso had a lucky escape today when he crashed out of podium contention during the Czech Republic MotoGP race. The Italian had passed Casey Stoner on lap three but just one lap later and he lost the front-end of his factory Honda RC212V at turn nine. The tumble was so slow though that the former world 125GP champion came to a halt in the middle of the track and only decisive and evasive action from Valentino Rossi, Colin Edwards and Nicky Hayden prevented a sickening collision. Rossi was the closest to striking Dovizioso and the 24-year-old admitted he’d been lucky not to be hit. “When I was in the middle of the track it was pretty scary because the riders behind were going either side of me, so actually I was lucky that the consequences weren’t worse, “said a relieved Dovizioso. Dovizioso though was just as upset as he was relieved as his crash extended his dismal recent run of results. Having made a stunning start to the season with four podiums in the opening five races, he’s now gone five successive races without a podium. 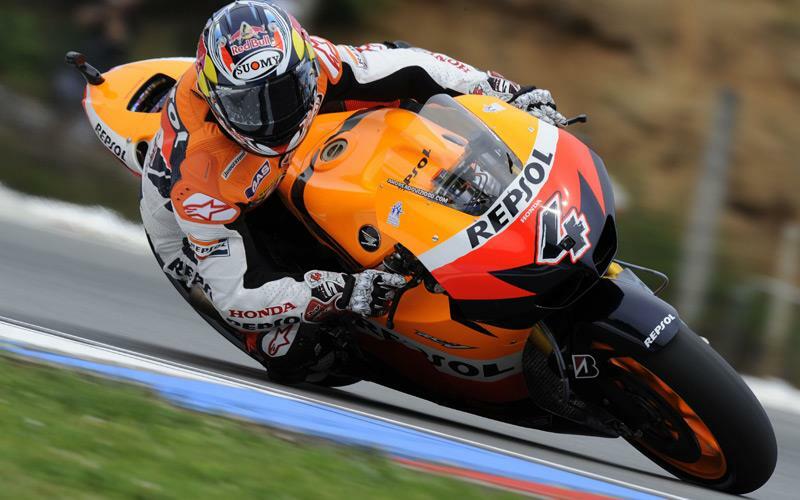 His lost third place in the overall rankings to Casey Stoner and Ben Spies in seventh is now just 25-points Dovizioso. He added: “When the front closed it closed a little bit faster than I expected and I couldn’t recover the mistake. I think a lot of people were at the limit with the front and the wind had an impact on this and also the rubber on the ground was not so much. "But I am so angry because I could have fought for the podium and I think for second place with Dani. "I am really frustrated about that because this track for me has always been really bad and we made a really good weekend and in the race I was there and fighting at the front.